Max Curry, owner and senior reporter with Elite Reporting Services. Imagine a courtroom scene and several images might come to mind – a robed judge, a row of pensive jurors, a zealous prosecutor or passionate defense attorney. But there’s a quiet, busy person in a typical courtroom environment that often goes unnoticed: The court reporter. These highly-skilled professionals often draw top salaries – $100,000 a year or more if they are the very best at what they do. “You can make great money as a court reporter if you are committed and willing to very work hard. One-third of our reporters make six figures,” says Max Curry, owner of Elite Reporting Services, a statewide firm with offices in Nashville, Chattanooga, Knoxville, Memphis and Jackson. The need for court reporters and their turbo-charged stenography skills is also burgeoning outside of the legal industry. When you see closed captioning scrolling across your TV screen during a daily talk show or tennis match, you can be sure the person typing out the captions has court reporting skills. It’s possible the person performing the closed captioning is sitting in the comforts of their office home while working on contract with a network – and getting paid extremely well to do it. Yet, despite the promise of higher-than-average pay and a career that can offer variety and flexibility, the court reporting profession is facing a looming shortage nationally – and in Tennessee, too. Ducker Worldwide, an international market research firm, reports there will be a shortage of more than 5,500 nationwide court reporters by 2018 and, within the next two or three years, demand will exceed the supply. Some states such as California, Illinois and New York are facing critical shortages. Tennessee’s shortage, currently at about 150-plus, according to the Ducker report, isn’t extreme but is notable. Curry, a 28-year veteran of the industry, is starting to feel the crunch at Elite Reporting Services. Elite has its largest office in Nashville but has outposts in Knoxville, Chattanooga, Memphis and Jackson. The firm also serves the eastern side of Arkansas, North Mississippi, Southern Kentucky and North Georgia. 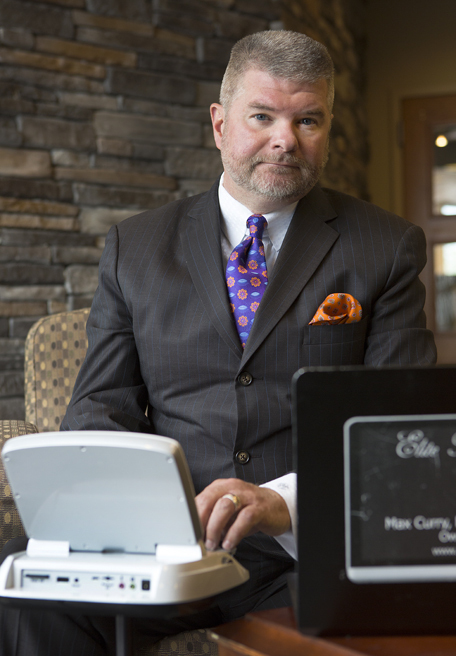 As a part of his role as a board member of the National Court Reporters Association, Curry is actively reaching out to the public to let them know about the profession and what it requires to succeed. “It takes (most people) about two to two-and-a-half years to get to the point where you are able to write the national speed for certification,” Curry adds. 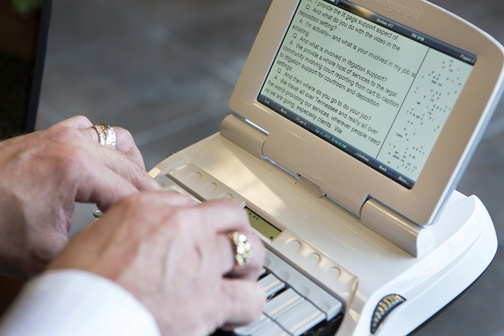 Because technology has become so advanced in recent years, the most successful court reporters willingly adapt to – and learn as much as they can about – whatever new gizmos, gadgets and programs are available to enhance what they offer to clients. In other words, not only do you need to be good with words and grammar to succeed at the profession, it’s going to help you tremendously if you are a bit of a technology geek, or at least patience enough to learn a new technical skill. Elite Reporting Services offers “real-time” reporting, which is the typical term for transcription by court reporters, using specialized techniques that can deliver text within a few seconds of words being spoken. Highly specialized software allows participants in court hearings or depositions to make notes in the text and highlight portions for future reference. “One reason Elite is in high demand is we have the most certified real-time reporters (seven reporters) in the state within one group,” Curry says. One reason why the court reporter shortage remains a pesky problem is because trained professionals are aging and younger people aren’t flocking to fill the void. The average age of a court reporter is 53, NCRA reports, while the average age for American workers is a decade younger. And thousands working court reporters are expected to retire in the next few years. Nativa Wood, president of the NCRA, says much of the battle lies in finding people who are looking for career alternatives. It might be a motivated, talented student interested in bypassing the expense of a four-year degree, someone who’s already graduated from college but hasn’t found rewarding work or a career changer who’s ready for a fresh new profession. “The main thing we’re working on is bringing awareness to court reporting as an option,” Woods says. “It may be the new career you never thought of. But creating a new generation of court reporters might be harder than it sounds, even though the pay is high and training doesn’t require a four-year degree. One reason: the discipline and practice it takes to learn the proper skills automatically weeds out some people. And, access to education is tricky since many brick and mortar schools have been shuttered over the past 20 years. Increasingly, aspiring court reporters enroll in online programs out of necessity. Not everyone in the industry thinks online is the way to go. Many say they believe in-person instruction is a far superior way to learn a trade that requires so much practice and mentoring. “My heart goes out to students studying online,’’ says Sheila Wilson, owner of Chattanooga-based Wilson Reporting Services. Wilson, who has been a court reporter since 1986, employs four full-time and several part-time reporters at her firm. “Chattanooga had an abundance of court reporters at one time,” Wilson says, explaining that Chattanooga State Community College used to offer an A.A.S. degree in judicial reporting. The closest school is Gadsden State Community College in Gadsden, Alabama. “It takes a tremendous amount of tenacity to get through school,” says Kristen Burke, an associate reporter with Elite Reporting Service based in Seymour. Max Curry’s stenotype machine, a modern version of the machine that once produced paper transcripts. “Learning the theory of court reporting is like learning another language,” Burke adds. “The most difficult part is speed building in increments up to 225 words per minute. It’s during this phase in which most of the 35 people I started my theory class with dropped out and only about four or five of us graduated. Some who are active in promoting court reporting say they believe there’s a financial barrier to breaking into the profession. “It’s very expensive to start as a court reporter now,’’ says Peggy Giles, a Knoxville-based court reporter who has been working in the industry since 1973. Another issue is the cost of getting an education. Traditional court reporting schools generally charge by the quarter, semester or credit hour, and most of them range between $24,000-$57,000 for a 2-or 3-year program. Furthermore, because of the difficulty of learning the trade, the dropout rate in court reporting programs is high, Wilson notes. Jim Beres, owner of Beres & Associates in Nashville, says a successful court reporter has to push themselves pretty hard. “You need to be driven to succeed at court reporting,” Beres points out. “You will know if you are meant for it when you sit down (and start learning the typing techniques.) You’ll take to it like a fish to water or you won’t. Beres company is in a family-owned firm where he has worked for many years alongside the two other court reporters in his brood – wife Jenifer and daughter Katy Melcher. Jenifer recently retired after a 36-year career, but Jim, Katy and two other staff reporters are going strong. Beres’ firm stays busy, primarily with depositions, but the veteran reporter has a side specialty that’s allowed him to travel nationally and internationally. Eight or nine times a year he travels to major sporting events such as NCAA football bowl games, March Madness tournaments, Major League Baseball, the Kentucky Derby and various PGA and LPGA tour events and NBA games. He has been on the scene and transcribing sports interviews with athletes such as Peyton Manning and Tiger Woods and college coaching legends such as John Calipari and Rick Pitino. Beres is decidedly grateful for his career, but he’s unconvinced that the profession can attract the talent it needs in the future. “It’s a good profession, and it’s provided me with a very, very good life,” Beres says. “It’s given me things I never dreamed would happen to me. “But, to tell you the truth, I don’t know where it (court reporting) is going at this point. When my generation goes, we’re really gone, and we won’t come back. Despite the barriers to court reporting, the potential for making good money seems to be a constant. The starting salary for court reporters, according to Ducker Worldwide, is $43,000, but that’s just the beginning. CourtReporterEdu.net, a court reporting clearinghouse on the internet, states the average salary of a court reporter in Tennessee is $52,660. The average salary for court reporters in the 10th percentile is $105,000. Ken Gibson, owner of Gibson Court Reporting in Knoxville, and a 40-plus year veteran of court reporting, says he thinks the profession will continue to adapt with the times. “Is technology going to come up with something that will put the court reporter out of business?” he asks. “It hasn’t happened yet,” he answers. “Necessity is the mother of invention, and I do think there’s always going to be room for good court reporters despite what technology can do. There will be some changes because of the shortage. As the shortage gets more critical I think some attorneys are going to be accepting lesser quality work. Gibson offers seasoned advice to the prospective court reporting student. “If you are willing to find a good school and put in the required two or three years, and know that it’s highly technical, very hard work, then it’s a wonderful career, very worthwhile,” he says.